DAYTONA BEACH, Florida (November 20, 2015) – A record 13 different drivers won races in three days of on-track action for The Stuttgart Cup and Mission Foods GT3 Cup Trophy USA this past weekend at the Historic Sportscar Racing (HSR) Daytona Historics at Daytona International Speedway. The large number of race winners, the most in the combined history of the two of Porsche-based racing series operated by America’s GT Cup, came in various classes in a pair of sprint races and a one Enduro on the Daytona International Speedway (DIS) road course this past Friday and Saturday. The list includes multiple race winners in both series, with Dominique LeQueux in the Stuttgart Cup and Mission Foods GT3 Cup Trophy drivers Lance Willsey and Jeffrey Freeman all doubling up on race wins. Willsey kicked things off with an overall and 4-liter Mission Foods GT3 Cup Trophy victory in Friday afternoon’s first sprint at the wheel of his 2013 No. 32 Porsche 997 GT3 Cup prepared by Orbit Racing. He later went two-for-two on Friday with a Mission Foods GT3 Cup victory in the late afternoon one-hour Enduro that also saw him finish third overall behind a pair of prototypes. Freeman scored his pair of wins in the Friday and Saturday sprint races, taking 3.6-liter class honors in his 2013 No. 16 Porsche 997 GT3 Cup. He also added a second-place class finish in the Enduro in what was a perfect-podium weekend for the Washington state based Autowerks Northwest team and driver. LeQueux mirrored Freeman’s weekend results in the Stuttgart Cup, sweeping both sprints in his No. 30 MOMO-themed Cayman S from Goldcrest Motorsports, and taking runner-up honors in the Enduro. Johnny Gray drove his 2012 No. 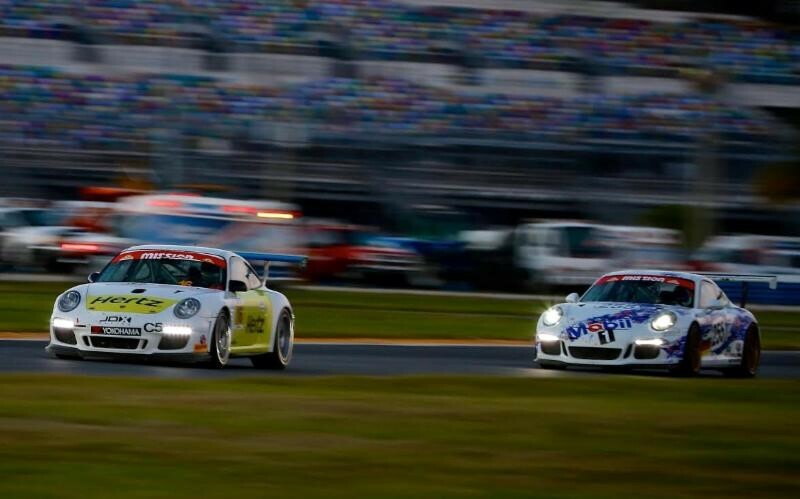 31 Porsche 997 GT3 Cup from Orbit Racing to the 4-liter victory in Saturday’s sprint. He also scored runner-up honors behind Willsey in both Friday races. Juan Lopez-Santini won the 3.8-liter Mission Foods GT3 Cup class in the Friday sprint and finished second overall in his 2008 No. 810 Porsche 997 Cup prepared by the 901 Shop. Other 3.8-liter Mission Foods GT3 winners at Daytona included Team Salad drivers Mark Sandridge and Joe Varde who finished first in class in the Enduro in their 2015 No. 225 Porsche 991 Cup car. Debuting Mission Foods GT3 Cup driver Roberto Bengoa in turn captured the Saturday sprint and took the overall win in his 3.8-liter No. 157 2011 Porsche 997 GT3 Cup fielded by Orbit Racing. The 3.6-liter Mission Foods GT3 Cup Enduro win was earned by Linden Burnstein in the 2007 No. 917 Porsche 997 Cup prepared by KMW Motorsports. Behind runner-up Freeman, Burnstein’s KMW teammate Jonathan Ziegelman placed third in his 2007 No. 911 Porsche 997 Cup car. 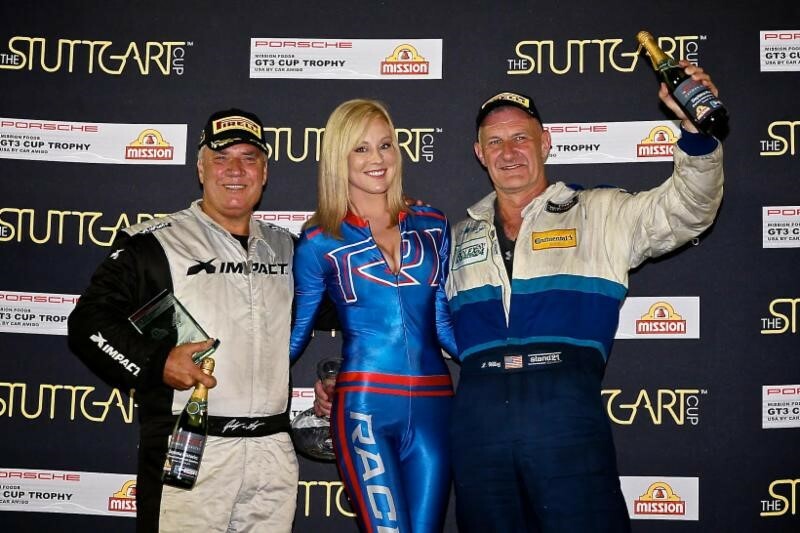 The Stuttgart Cup produced two different Cayman class winners in the Enduro. Bill Riddell drove his Racelink-prepared No. 05 Cayman S to his third-straight Enduro race win while Ed Lane teamed up with Jack Baldwin in the Lowenbrau/Al Holbert Racing-themed No. 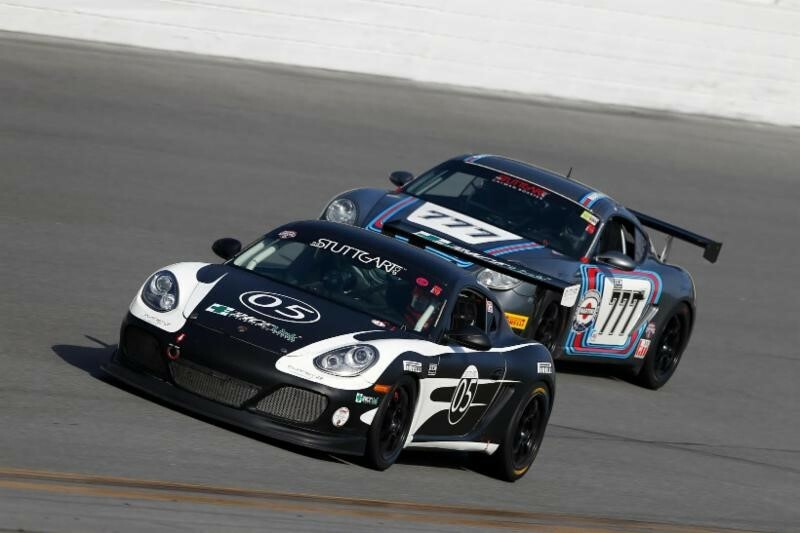 14 Cayman S to take the Pro class victory. Lane’s Cayman is run by the 901 Shop. Other Stuttgart Cup winners included No. 70 Boxster driver John Reisman who won both sprints competing with the Hudson Historics team. Notable podium showings at Daytona were earned by half a dozen other drivers. Debuting driver Robert Booth drove his No. 571 Cayman S from Limitless Motorworks to third in the Enduro while fellow first-time Stuttgart Cup driver Franklin Pray podiumed in both sprints, finishing third in his first race in the series on Friday and second on Saturday. Pray drives the No. 777 Martini-themed Cayman S fielded by Bodymotion Racing. Podium players in Mission Foods GT3 included Gilsdorf Racing 3.6-liter teammates Carmine Reppucci and Jack Gilsdorf, who finished second and third, respectively in Saturday’s sprint. Reppucci drives the 2003 No. 164 Porsche 996 GT3 Cup while Gilsdorf races the 2005 No. 901 Porsche 996 GT3 Cup. John Reisman’s father, Paul Reisman, also hit the 3.6-liter GT3 podium with a second-place finish in Friday’s sprint at the wheel of his Hudson Historics 2007 No. 71 Porsche 997 GT3 Cup. Terry Gray, Johnny Gray’s wife, made a pair of 3.8-liter Mission Foods GT3 podium appearances in her 2011 Porsche 997 GT3 Cup from Orbit Racing. She finished second with co-driver Lonnie Pechnik in the Enduro and third in Saturday’s sprint race. 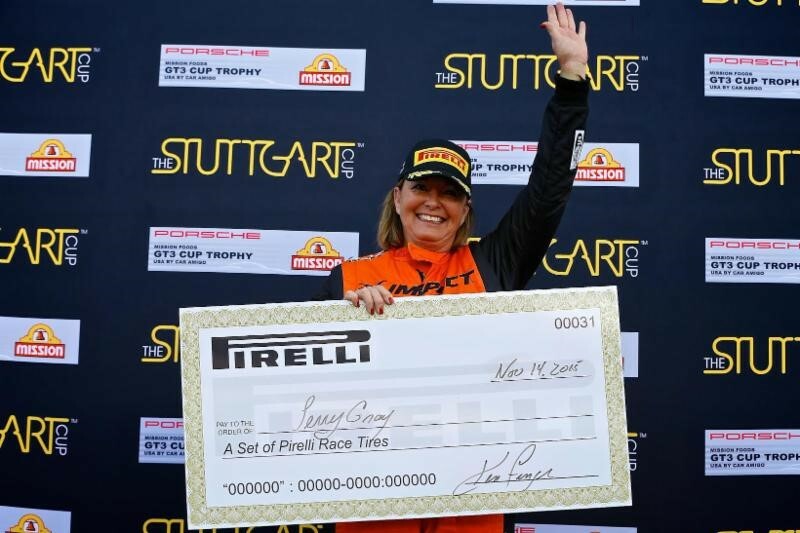 Terry Gray’s podium performances at Daytona were enough for her to earn the Pirelli Tire Award, which provides a full set of four Pirelli P Zero racing tires to each recipient. Returning driver Scott Leder also earned a set of Pirelli P Zeros as the Pirelli Tire Award Stuttgart Cup recipient. Leder races a Rothmans-themed No. 87 Cayman S out of the Bodymotion Racing shop. Next up for The Stuttgart Cup and Mission Foods GT3 Cup Trophy USA is the season-ending Sebring Historics at Sebring International Raceway, December 3 – 6. 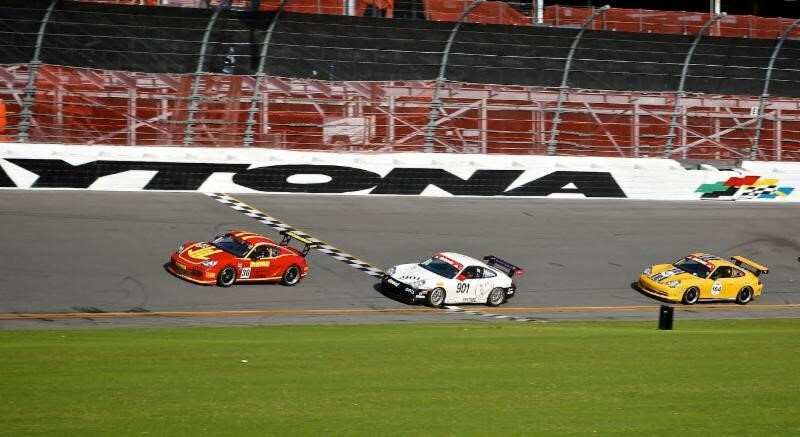 – Several Stuttgart Cup and Mission Foods GT3 Cup Trophy USA competitors also participated in the Classic 24 Hour at Daytona presented by IMSA, which began at 1 p.m. Saturday following the completion of the regular HSR championship events. The big winners turned out to be debuting drivers Bengoa and Pray who both won their respective Classic 24 classes in their debut HSR race weekends. Bengoa co-drove his No. 157 Porsche GT3 with Pechnik to the E-5 class victory and was awarded a BRM Chronographes watch as the highest finishing GT entry in Group E. Pray in turn finished an amazing third overall in his No. 777 Cayman S in Group F and also earned a BRM Chronographes watch for finishing first in the HSR Group 10/Stuttgart Cup division. Pray was joined on the podium by Bodymotion teammates Leder, Tom Kievit and his son, Griffin Kievit, who finished second in the class and a solid fifth overall in the No. 27 Cayman S.
– Riddell and Shane Lewis also teamed up for the Classic 24 as did the duo of Reppucci and Wayne Wilkerson. Riddell and Lewis led their class in the No. 05 Cayman – renumbered No. 16 for the Classic 24 – after the race’s first two segments only to be knocked from winning contention in the third segment with a broken shifter. Reppucci and Wilkerson finished second in the D-5 class in Reppucci’s No. 164 Porsche 996 GT3 Cup. All America’s GT Cup racing series compete with the support of official series partners Pirelli Tire North America, BRM Chronographes, Pacifico Costa Rica, Mission Foods, Racerink, VP Racing Fuels, Palm Beach Driving Club and Bob Woodman Tires.